Hubby received a beautiful Birthday gift from Zlaty, our DIL. She made him a wallhanging with ships and lighthouses. He loves the ocean and ships, so it was just perfect for him. And for those of you who don't know this, I love lighthouses. She did a beautiful job with the quilting and even finished the quilt with a coordinated wavy binding. That could not have been easy to do. Thank you Zlaty. He loves it! It is beautiful! You can see more of Zlaty's quilts here. This past weekend we went away with friends to Philadelphia to celebrate my hubby's birthday. We had a great time! While we were there we stopped by the Comcast building. 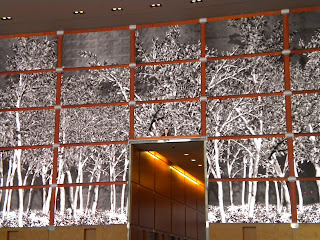 They have a huge tv screen built into the wall in their lobby. It is incredible! The screen just keeps changing and it is hard to tell that it is not a wall, but a screen. One of the things that they showed were some windows. I was so excited when I saw one of the windows had a quilt hanging in it, with a dress form in front. It's the little things in life that make us happy! Here are a couple other scenes that appeared on the wall. If you click on the picture you can see the detail of the people in some of the sections, like they are pushing the pictures across the space. They look so real, just like they are up there on the wall. Brenda has some antique dresden plate patches to put together into a quilt. I just love antique patches. Leisa is working on a beautiful wool quilt! Zlaty is working on beautiful tablerunners. I am so lucky. As you may remember I got one for a gift this past year and just love it! She also had two cute snowman blocks from Art to Hearts's "Be Attitudes" Book. I'm afraid that the picture turned out too light. I will share pictures of that project when Zlaty has finished them. They are just too cute! Stacey got another row finished on our past year's club project "Cottage Garden Sampler" It is just beautiful! Box of Chocolates. I just love the colors! Melissa shared many projects that she finished lately and some that she just is starting. I just love this mini quilt she made from her leftover scraps from one of the Happy Sewing Room Challenges. Our club members have a choice of doing 2 projects this year. 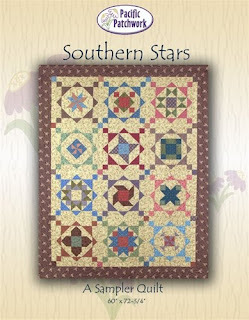 Southern Stars or Block Party by Paula Stoddard of Pacific Patchwork. Paula has wonderful patterns. You can see her designs here. The ladies doing the Southern Stars can make one block a month and the ladies doing the block party will receive a pattern for a quilt and newsletter featuring each letter of the alphabet each month. The newsletter contains directions for a 6" block of the featured quilt and the alphabet letter for a separate quilt and also a small project using the featured quilt blocks. If anyone is interested in doing block party and would like more info, please email or call me at 610-562-7173. They also have a project where you can make a quilt block and enter it in their quilt block contest. They do have monetary prizes, but the best part about doing this is that the blocks that they collect will be put together and quilted the following year at the show and then the next year that will be their raffle quilt. 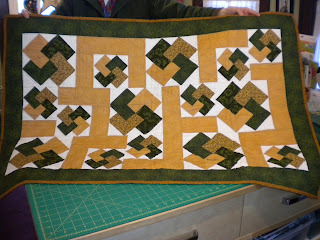 The funds earned from the quilt raffle benefit the Farm Show Scholarship Foundation. I think that is a great idea! 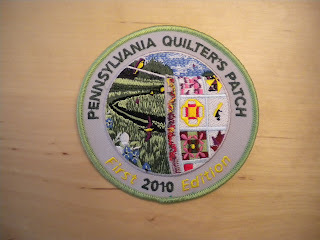 This year they have designed a Pennsylvania Quilters Patch which features a picture of the raffle quilt on the patch. This year is the first in a series of them. I have started my collection and look forward to next year to purchase the next one. They also have fashion sewing, knitting crocheting and so much more. There are also many other areas of the show that we enjoyed. They do have many animals to see, things for kids to do, a great food court! and too much too mention. Below are a couple other things that we saw. Here is the link if you would like more info about the show. Thank you so much for your support over the past 19 years! I have made so many wonderful friends throughout the years and I look forward to seeing you all this year! Sylvia stopped by for a visit and brought a quilt to share. She had chosen the fabrics from the shop many years ago and when I spoke to her, I asked if she would bring it along the next time she stopped by. She did, and I am so glad that she did! It turned out beautiful! 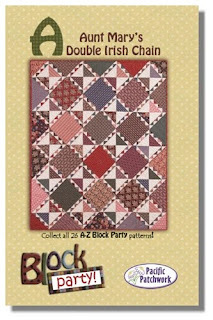 I love the small and large card trick blocks mixed in the same quilt. Beautiful job Sylvia! Thanks so much for stopping by. It was great to see you again!